As much as we like to think of a lanyard being such a simple product the process behind it is fairly complex and ingeniously managed by machines that operate at very high speed. The whole process of production is automated and begins in the area of the factory that manufactures and prints the material in a base color. It then moves to the other area of the factory that actually creates the lanyard from start to finish as we see it shops and supermarkets. The production process as I mentioned above starts with creating the material in a factory area were workers do the basic weaving for the material that will later be used for all the lanyards. Here workers use impressive machines which basically are some technological weavers. The machines are fed with colored threads which in the end result in a very large piece of material .Then they are cut in several straps which then will be rolled on fixed size rolls. Then rolls will then be shipped to the factory that produces lanyards. Sometimes factories have the infrastructure of the creation process of the material used for making lanyards inside the factory as a side production line. - The miscellaneous frame stand on which all the machines are set and where all the lanyards go through. Usually these types of machines are manually adjusted. You can’t just go to a supermarket or even a tools specialized shop and ask for an industrial machine of this size. You need engineers that have experience in creating custom parts and linkages. Large factories purchase key machines from distributors and assemble them with components that will create a continuous production process line. These are a few visual examples of the production line machines. As the image shows, all the rolls are now fitted in specific compartments to be linked with the main machine. This is the part where the straps are being linked to the first machine. A bit further on line the straps are being Screen Printed. Usually Screen Printers manage to do around 12 inches, but this machine manages to print on all 36 inches of the length. Next machine in the assembly is the dryer, which heats up the straps so the paint will dry. By the time the lanyard gets here it’s painted and dried and now it’s being cut to a specific size required by the customer. The most important component of the production line is the printer. 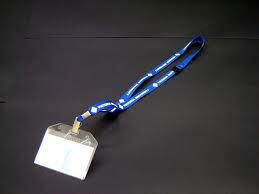 The method employed by the manufacturers in printing their lanyards is usually screen printing. Compared to the other two most commonly used methods of Dye Sublimation and Hot Stamping, this method provides good quality at a reasonable price. Hot Stamping is the cheapest method and Dye Sublimation is the most expensive. Screen Printing is the best of both worlds. It’s also very durable and also heat treated so you get high-resolution artwork. Nylon and cotton are the most preferred materials for this type of printing because they are smoother and allow more details to be imprinted. Typically, the screen printed lanyards are printed in one or two colors. Although single-sided printed is more cost effective and most common, some customers prefer double sided printing as well. New technologies today facilitate the production of new ways of manufacturing and printing lanyards which are cheaper and more available to the average entrepreneur. The tools are getting smaller and less complex, although you can only get top quality with industrial size machines. There are plenty of distributors around the world that provide you with everything you need, from consultancy up to infrastructure and tools, to be able to start producing your own lanyards.